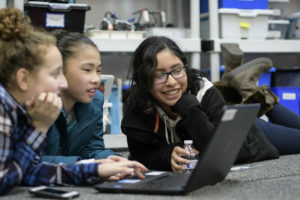 UPDATE: As of March 5th, registration for Girls Who Code at the Hoboken Public Library is full. If you would like to be placed on a wait-list, contact Karl Schwartz at karl.schwartz@hoboken.bccls.org. Thank you! Questions? To register, visit the Hoboken Library’s Eventbrite Page. Questions can be directed to Karl Schwartz, Head of Young Adult Services at Karl.schwartz@hoboken.bccls.org or (201) 420 – 2348.